This topic describes how to upgrade to a point release of Pivotal Application Service (PAS) and other product tiles without upgrading Ops Manager. For example, use this topic to upgrade from PAS v1.9.0 to v1.9.1. You might need to perform this upgrade if a security update for PAS is released, or if new features are introduced in a point release of a product tile. For PAS component and version information, see the PAS release notes. Note: If you cannot download products from Pivotal Network due to restricted network connectivity, see Installing PCF in Airgapped Environments. You must have completed the Upgrading Pivotal Cloud Foundry procedure. Refer to the Product Compatibility Matrix before upgrading PAS. Important: Read the Known Issues sections of the products you plan on installing before starting. See Pivotal Cloud Foundry Release Notes for all available product release notes. Note: If you are using the Pivotal Network API, the latest product versions will automatically appear in your Installation Dashboard. Click the plus icon next to the uploaded product description to add this product to your staging area. Click Review Pending Changes, then Apply Changes to install the service. 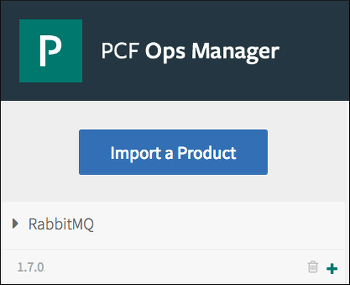 This section describes how to upgrade individual products like Single Sign-On for PCF, MySQL for PCF, RabbitMQ® for PCF, and Metrics for PCF in your Pivotal Cloud Foundry (PCF) deployment. Ensure you review the individual product upgrade procedure for each tile. Browse to Pivotal Network and sign in. Download the latest PCF release for the product or products you want to upgrade. Every product is tied to exactly one stemcell. Download the stemcell that matches your product and version. Confirm that you have adequate disk space for your upgrades. You need at least 20 GB of free disk space to upgrade PCF Ops Manager and Pivotal Application Service. If you plan to upgrade other products, the amount of disk space required depends on how many tiles you plan to deploy to your upgraded PCF deployment. To check current persistent disk usage, select the BOSH Director tile from the Installation Dashboard. Select Status and review the value of the PERS. DISK column. If persistent disk usage is higher than 50%, select Settings > Resource Config, and increase your persistent disk space to handle the size of the resources. If you do not know how much disk space to allocate, set the value to at least 100 GB. Browse to the Pivotal Cloud Foundry Ops Manager web interface and click Import a Product. Select the .pivotal file that you downloaded from Pivotal Network or received from your software distributor, then click Open. If the product is successfully added, it appears in the your product list. If the product you selected is not the latest version, the most up-to-date version will appear on your product list. Click the plus icon next to the product description to add the product tile to the Installation Dashboard. Repeat the import, upload, and upgrade steps for each product you downloaded. In the left-hand column, select the setting page containing the SSL certificate configuration. For example, for PAS, select the HAProxy page. Check the Trust Self-Signed Certificates box. Give the new replica the same name as the existing replica. See the following example workflow. You used the replicator to generate a replica of v1 of the Isolation Segments tile. You used the name seg-one. You installed the tile in Ops Manager. Download and unzip the new Isolation Segment Tile Replicator from Pivotal Network. You must download the version of Tile Replicator that corresponds with the version of the Isolation Segment Tile you want to replicate. NAME-OF-EXISTING-REPLICA must be the same as the name used for the existing replica. This is seg-one in this example. PATH-TO-NEW-TILE is the path to the new Isolation Segment Tile. After you have the replica tile p-isolation-segment-v2-seg-one.pivotal, upload it to Ops Manager. This upgrades the v1 replica tile in place.